A seat numbering plan shows you where your seat is located in the carriage. Seat & berth numbers are often not consecutive, for example 21 & 25 are an upper & lower berth in the same 2-bed sleeper. Seat Guru for trains? Maybe not quite yet! 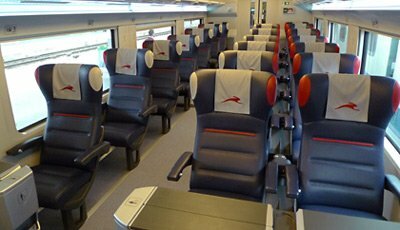 But on this page you'll find links to train seating plans, showing the layout and numbering of seats & sleeping berths in specific types of train and carriage for the key countries in Europe. Keeping all the links working is difficult, so please report any dead links, or any new train seat plans. For Germany, showing both domestic and international trains by train number, see www.grahnert.de/start421.htm. If you don't know the train number you want, use the journey planner at www.bahn.de to look it up, clicking on the service you want in the search results to see details including the train number. For domestic and international trains in Germany, Austria, Spain, Portugal, much of eastern Europe and the Balkans, see www.vagonweb.cz/razeni/. It can help to know that EN stands for EuroNight sleeper train, EC for EuroCity quality daytime train, IC for InterCity quality daytime train, and so on. Can I book a specific seat? When booking online, a few operators allow you to book a specific seat from a graphic numbered seating plan if you book directly on their own website - such operators include Eurostar at www.eurostar.com (only after payment, using the 'manage a booking' link), German Railways at www.bahn.de (but only for German domestic journeys on German IC or ICE trains), Swedish Railways at www.sj.se, Spanish railways at www.renfe.com (but only for Spanish domestic journeys and only if you buy a Promo+ fare or higher) and a few others. But these tend to be the exceptions, it's only for their own trains in their own country, and if you buy from a third party site you won't get that functionality, it's only if you book with the operator directly at their own site. Most other booking sites only let you choose 'aisle' or 'window'. If you want to book a specific seat on any other train, you'll need to book by phone, preferably with an agency that uses the relevant country's own reservation system. For example, if you call SNCF or (in the USA or Canada) Rail Europe, these use the French Railways reservation & ticketing system and can easily book a specific seat on a French TGV. But they can usually only select basic options such as 'aisle' or 'window' when booking a German or Italian or Spanish train. Conversely, the German Railways UK office obviously uses the German reservation and ticketing system, they can easily book you a specific seat or type of seat on a German ICE, but can only access basic options such as 'aisle' or 'window' on Eurostar or on a French or Italian train. There's a list of UK booking agencies here, if you really want to book a specific seat then try calling an agency with the most relevant reservation system. Are we booked in the same sleeper compartment? Berth numbering in sleepers and couchettes often causes confusion. People with berth numbers 21 & 25 wonder if they're really together in the same 2-bed sleeper, when yes they are! 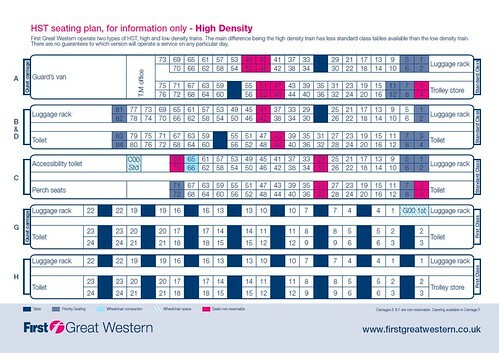 Look at the 'generic' sleeping-car numbering plan below, or search for the specific sleeper train you're booked on in the list below, based on the country in which your journey starts. Adjacent compartments may have a communicating door when people travelling together occupy both compartments, for example 11/13/15 will often have a door through to 12/14/16, 21/23/25 will have a door to 22/24/26 and so on. Typical sleeper numbering plan. 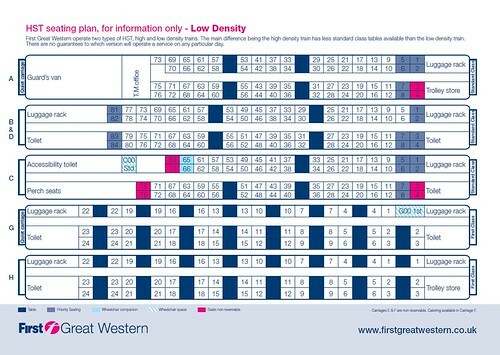 When used as a 2-berth, only the top & bottom berth numbers are used, for example 21 & 25. Typical couchette numbering plan. When used as 4-berth, only the top & bottom berth numbers are usually used, for example 21, 22, 25 & 26. Some trains have seats in open-plan saloons, indeed most modern trains have this sort of seating. Some trains, often older ones and often in eastern Europe, have seats in traditional 6-seater compartments with a side corridor running the length of the car. There are sliding (but non-lockable) doors to each compartment. Very occasionally you'll find both sorts of seating on one train, and some booking systems (such as the German Railways site bahn.de or Austrian site oebb.at) will ask you which you prefer. Unless you're in a group of 5 or 6 people, most travellers prefer open-plan saloon seating, which also gives you a better view out as you can view diagonally forwards and backwards through all the coach windows, not just directly sideways through your own window. The 1st class cars on Pendolinos are normally at the London/southern end of the train. London - Leeds - York - Newcastle - Edinburgh - Dundee - Aberdeen, Inverness. Anything going north of Edinburgh must be diesel. Caledonian Sleepers. Trains within Scotland. A few Lille-Lyon-Marseille TGVs are Duplex. Many Paris-Bordeaux/Lourdes/Spanish border are now TGV Duplex Océane. Most services on this route are now worked by the new class 407 ICE3, click for seat plan. All French trains are now non-smoking, even though older seat plans may refer to 'smoking' cars. Car number greater than 10? 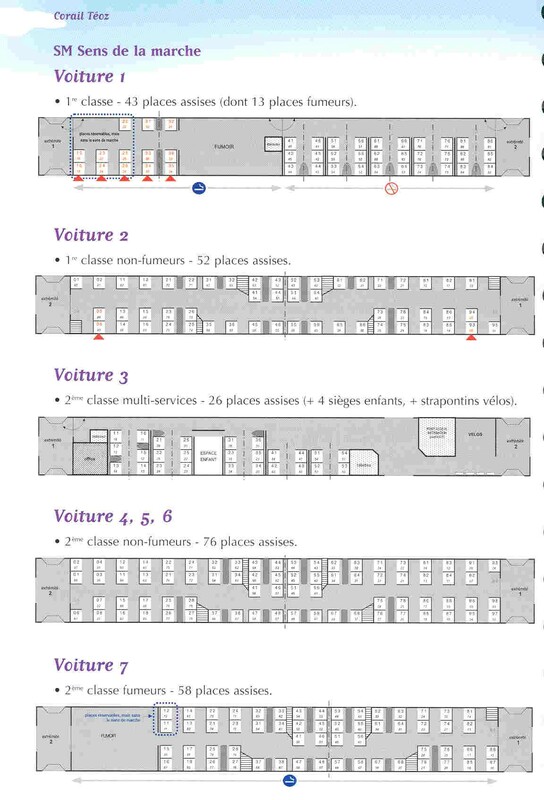 When two TGV units run coupled together, cars in the first set are numbered 1-8, the second 11-18. So car 18 is the same as car 8 on the seating plan. No seating plans available. All Belgian domestic trains are of the hop on and find a free seat variety, seat reservation not necessary or possible. No seat numbering plans available. All Dutch domestic trains are of the hop on and find a free seat variety, seat reservation not necessary or possible. No seating plans available for general Swiss train. Most Swiss domestic trains are of the hop on and find a free seat variety, seat reservation not necessary or possible. Comfortline sleeping car - this is a Czech CD-owned one. Turin-Milan-Florence-Rome-Naples 186mph+ high-speed trains. Trains with 4 classes, Standard, Premium, Business & Executive. Turin-Milan-Florence-Rome-Naples 175mph high-speed trains. Trains with 4 classes, Standard, Premium, Business & Executive. Various including Venice-Florence-Rome, Rome-Bari. 125mph tilting trains. Some trains use ETR485, some ETR610, some ETR600. Various including Milan-Verona-Venice, Milan-Bologna-Bari-Brindisi, Rome-Pisa-Genoa. 125mph trains. Various including Rome-Sicily, Milan-Naples, Milan-Sicily. No seat plan available for EVO trains. Go to www.vagonweb.cz/razeni. Click the UK flag, then click EC against Austria, then select your train & look for the seat plan icon underneath the relevant carriage. Go to www.vagonweb.cz/razeni. Click the UK flag, then click Railjet against Austria, then select your train & look for the seat plan icon underneath the relevant carriage. You can find seat numbering plans for Spanish trains at the Spanish Railways website, www.renfe.com/EN/viajeros/nuestros_trenes/index.html. Barcelona to Paris high-speed trains. Services on the Frankfurt-Mannheim-Paris route are now worked by the new class 407 ICE3, click for seat plan. Go to www.vagonweb.cz, click UK flag, click composition, select EIC against Poland & locate your train. Click the plan logo under each car. Vienna - Salzburg - Innsbruck - Zurich. Some departures use Austrian ÖBB red railjets, others Czech CD blue railjets. To check which operates your train, go to www.vagonweb.cz, select UK flag for English, select composition, then select RJ against either Czech Republic or Austria. Innsbruck or Vienna to Cologne, Dusseldorf, Hamburg. You can also find useful information about the composition of international trains to or from Austria at www.vagonweb.cz/razeni. You can check train compositions for domestic and international trains to, from or within the Czech Republic and Slovakia at www.zelpage.cz/razeni. You can search by train number (enter it in the box at the top) or click on a train category (for example, EuroNight or EuroCity) to see a list of trains. When you get to the train composition page, click on a carriage for specific carriage information, including a seat or berth numbering plan if they have one. You can also find information about the composition of international trains to or from Prague or Bratislava at www.vagonweb.cz/razeni. You can also find useful information about the composition of trains to or from Poland, Hungary, Slovenia, Croatia, Serbia, Macedonia, Montenegro, Bosnia at www.vagonweb.cz/razeni. Switch it to English by clicking the UK flag. Click composition then select the type of train against the relevant country. When you see the train formation, click on the camera logo under each car for photos. You may also see a seat plan logo, click for the seating plan.